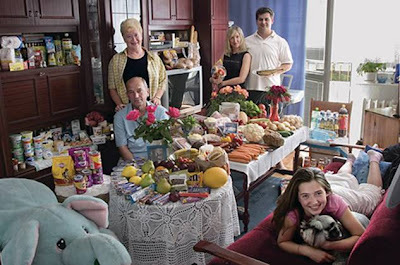 Time Magazine ran this article a couple years ago about the way people eat around the world. 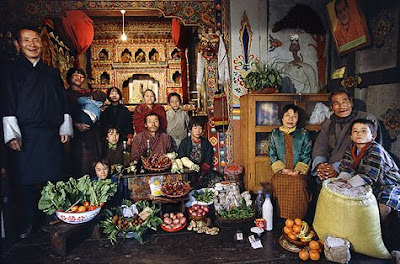 These photographs were taken by Peter Menzel for the book "Hungry Planet." 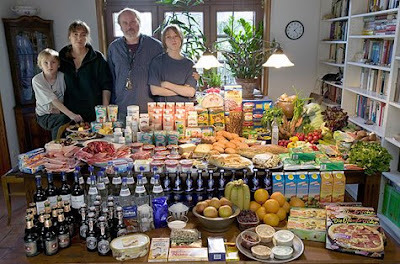 In each picture you get to see the weekly food intake for an average family of the country they represent. 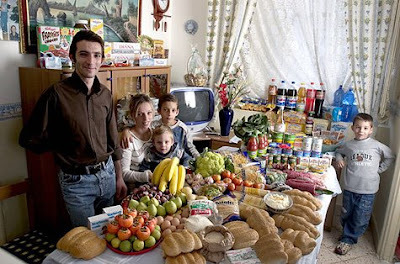 I think it would have been interesting to throw in a raw foodist family like the Boutenkos. 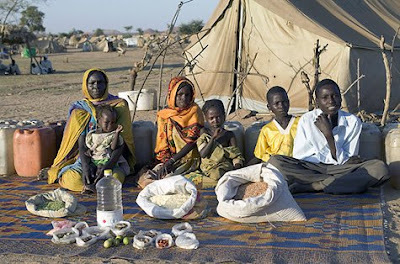 The American family's diet makes me sad as does the family from Chad. Heartbreaking. 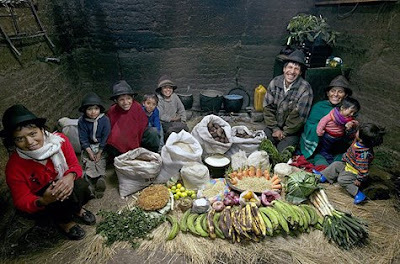 My favorite is the family from Ecuador. They don't have much but I love the smiles on their faces. Thoughts? This is really interesting. I'm on a budget and I still manage to eat healthy. Granted, there's just me. I imagine it's much more difficult when you're supporting an entire family. I agree about the Chad and Ecuador families. I have a question for you :) I've been vegan for a while but have been looking into eating raw lately. Do you have any cookbook suggestions? Easy is best. Thanks! Yes, you're right, of course you can eat well on a budget. I'm writing a book about it! 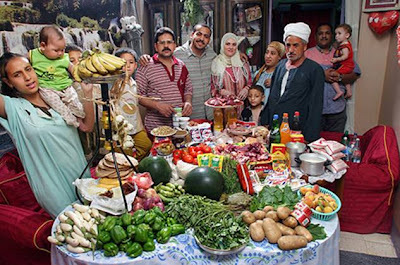 What I meant is that when Americans walk into their local grocery store they see that produce, especially organic produce,is much more expensive than giant, non perishible bags of Dorito's and cookies. 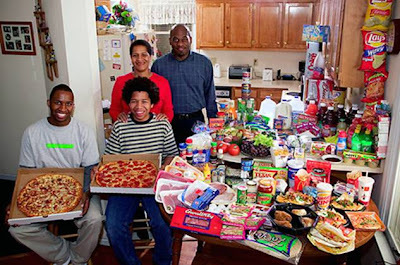 Fast food is much cheaper and easier than putting together a meal for an entire family as well. You can get 2 large Domino's pizza for $10. I wouldn't touch the stuff but when I was growing up in a one income family on a shoestring budget we did that all the time. If we knew then what I know now about nutrition and eating healthy we would have picked other options but it was all we knew. 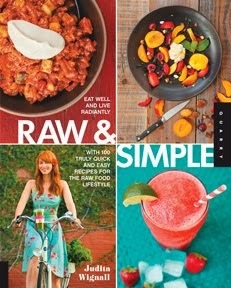 My favorite easy raw food book is Jennifer Cornbleet's "Raw Food Made Easy" which you can find on Amazon. No dehydrator needed. Yeah, I'm the daughter of a single mother and I grew up on ramen, hamburger helper, and pizza! Yiiikes!! I love this story, and have looked at it a few times myself. 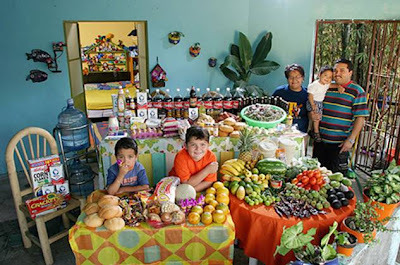 The Ecuador family really projects happiness to me, and I really admire the variety of their food! Such a fabulous range of fresh produce and whole grains unlike a lot of the others who have a large range of packaged products! Wow that's amazing, well that's too bad but I guess that I have better luck than them, it's really sad but the world it's like that.